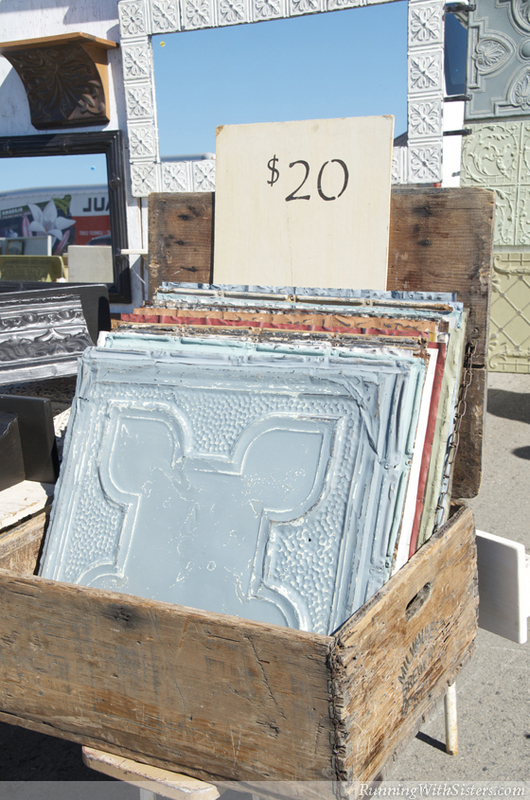 Our two most favorite summer weekend activities are crafting and going to the flea market. 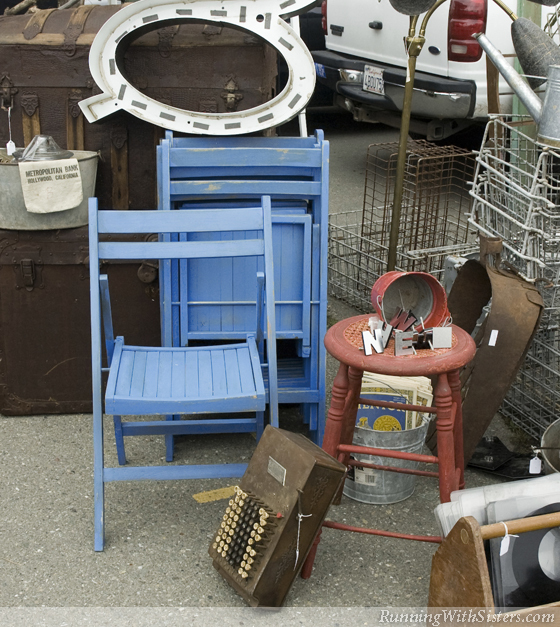 So after spending Saturday learning to make our own chalk paint (not to be confused with chalkboard paint), we couldn’t wait to hit the flea market Sunday to hunt for second-hand furniture––and anything else we could find to refinish! We paid the early bird fee and headed straight for the furniture section. We wanted to try out our farm-style paint, so we could turn something old into something old with character! 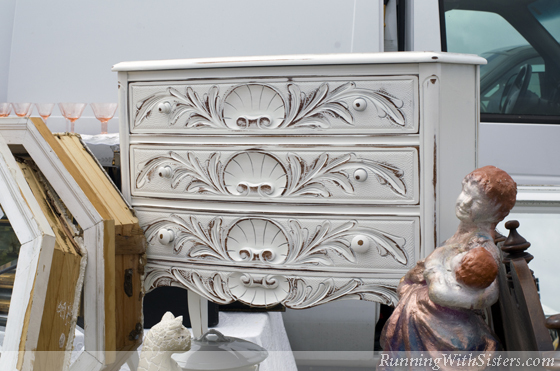 One seller had a sideboard with ornate carved legs, but the surface was warped from water damage. The same dealer had a piano bench with fantastic ball and claw feet, but the wood was so pretty we thought it’d be a crime to cover it up. Jennifer spotted two end tables across the aisle that seemed kind of run-of-the-mill. We took a closer look and saw that the legs were fun and spindly. The tables were marked $20 each. 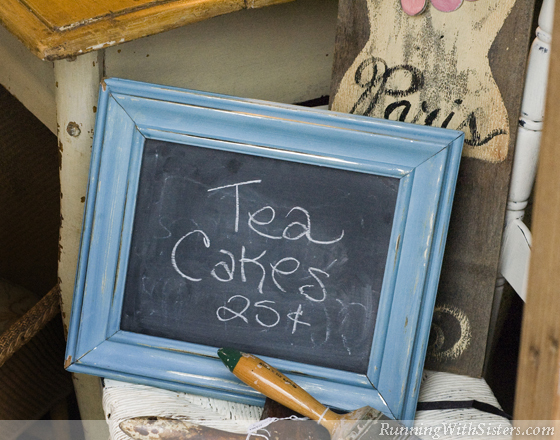 They’ll look like French flea market finds after a coat of chalk paint and a little distressing! Kitty bought a wooden caddy for only $10. She’s going to give it a chalky blue finish, then stencil a number on the end. Just the thing for washcloths in the guest bath. 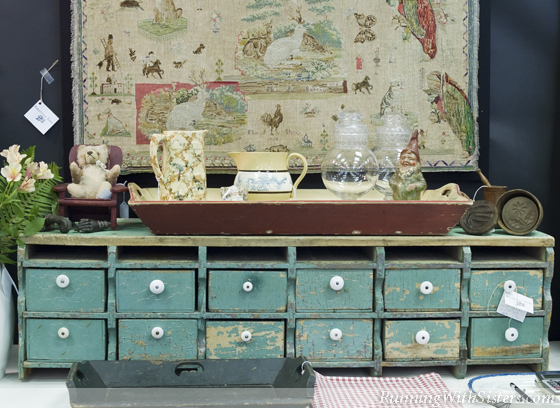 Next we found some truly antique farmhouse finds, beautifully worn and needing no redoing at all! They were the perfect inspiration for our own projects, so we wandered around the space noting what made them so timeworn. We studied the patina on a set of primitive drawers. It was clearly old, and the $895 price tag reflected that. Jennifer pointed out the chippy paint and how one drawer had a lot more wear than the rest. (Must have been something useful in there!) Kitty picked up a rustic red tray and noticed that the handles were more worn than the sides. Good to know! It was sitting on a green milking stool that had years of other paint colors showing through the roughed-up seat edges. All that unique character had a price, $250! We decided to get a more ordinary stool and try to recreate that effect ourselves. After a quick frozen yogurt break, we stepped into a booth loaded with chalk-painted pieces. It was amazing to see such a collection all together! 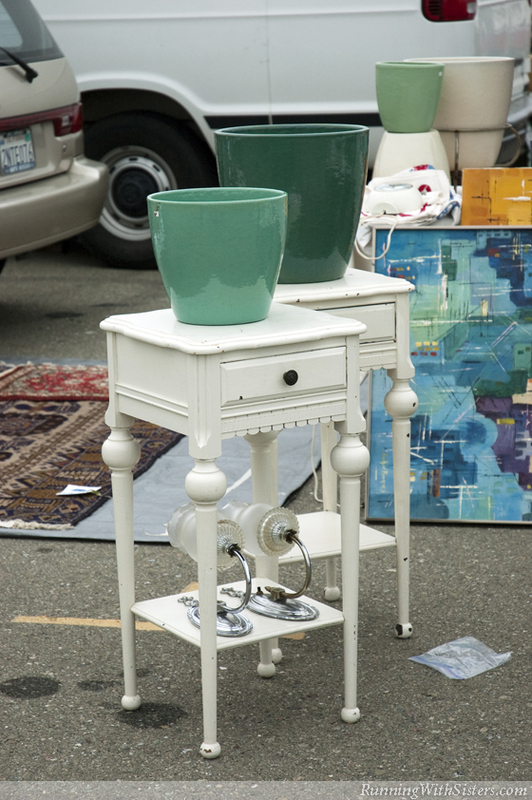 We told the vendor about the end tables we bought and asked her for tips and tricks. 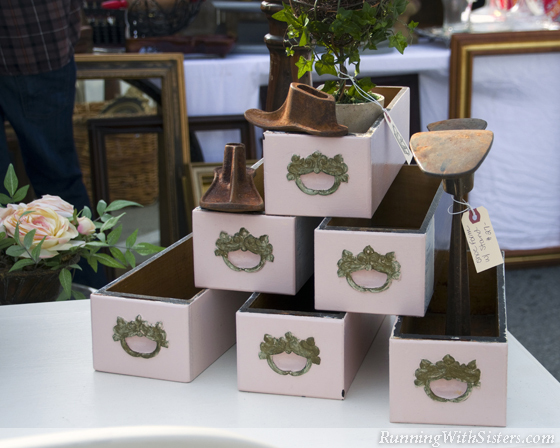 She revealed that she applies a dark wax over the paint, then burnishes it with Kraft paper. It shows off the brushstrokes and imperfections in the wood, and makes the piece look like it has survived “a century of dirt and grime.” She also said that even though chalk paint can be any color, she sticks to traditional hues like jade green, Suffolk pink, Robin’s egg blue, and old-country white – because that’s what sells. Boy, was she right! It didn’t take us long to pick out two green tin ceiling tiles and two pink sewing drawers. She let us have all four items for $50 and asked us to bring a photo of our finished tables next time. We love flea market homework!